Bamboo Brook Outdoor Education Center, located on 670.88 acres, was once known as Merchiston Farm and was the home of William and Martha Brookes Hutcheson from 1911 to 1959. Bamboo Brook’s original 100 acres was donated by the daughter of Mrs. Hutcheson. Ms. Hutcheson one of America's first women landscape architects attended Massachusetts Institute of Technology’s School of Architecture and Planning, along with other famous women garden designers of that time, including Marion Coffin and Beatrix Farrand. Her interests included what would become the field of Horticultural Therapy, the use of native plants, and the role of garden clubs (including her own, the Garden Club of Somerset Hills) in the advancement of civic horticulture. Ms. Hutcheson became a member of the Society of Landscape Architects in 1935. Her design of this garden was completed in the late 1920s, shortly after the publication of her book, The Spirit of the Garden, in 1923. 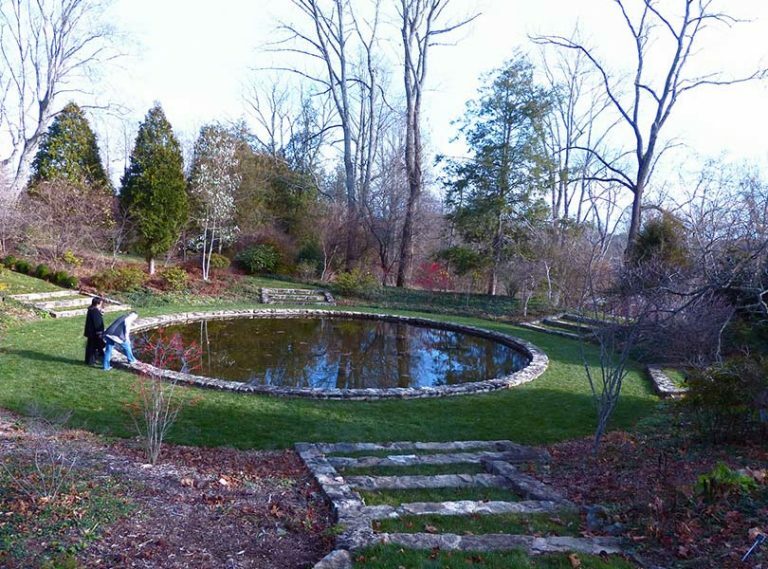 Accepted by the Morris County Park Commission in 1972, portions of the designed landscape of this garden, including the Coffee Terrace, Circular Pool, and the Upper and Lower Waters have been restored to their circa 1945 appearance with careful attention to the plants used. The restoration was made possible in part by the New Jersey Historic Trust/State of New Jersey and the Morris County Historic Preservation Trust Fund. The gardens are on the National and State Register of Historic Places. As you tour this garden, please take note of Ms. Hutcheson’s design principles at work throughout this property which were developed over a 35 year period. These include the formal framing of vistas along straight axes and circular ones, the enhancement of natural topography, the use of transitional structures and plants linking garden ‘rooms,’ the use of water as a design element, and the use of native materials, both plant and mineral. In addition to its formal areas, there are numerous trails that wind through the fields and along Bamboo Brook. The surrounding landscape includes rolling meadows and wooded areas. A wide variety of birds, butterflies, and animal life inhabit the area. Bamboo Brook is part of a larger network of more than 1,000 acres of preserved County parkland along the Black River and adjacent areas, extending from the Cooper Gristmill to the Elizabeth D. Kay Environmental Center and Willowwood Arboretum. A multi-mile series of trails connect these sites. Tented weddings and special events are also allowed on this property. Enjoy the splendid fall foliage by hiking and viewing the wildlife at the premier location. The Morris County Park Commission offers seasonal programs at this facility. Fall tours of the gardens and house are available for groups of 10 or more. For more information on tours, please call 973.326.7627. The New Jersey Conservation Foundation, which leases offices in the main house, presents a number of programs, focused on natural history offered throughout the year. In the winter when the snow falls, snow-shoeing provides a unique way to visit the site.The Morris County Park Commission offers seasonal programs at this facility. Tours of the gardens and house are available for groups of 10 or more. For more information on tours, please call 973.326.7627. The New Jersey Conservation Foundation, which leases offices in the main house, presents a number of programs, focused on natural history offered throughout the year. Visit www.njcf.org to learn more about them. Known originally as Merchiston farm, Bamboo Brook was the home of William and Martha Brookes Hutcheson, from 1911 to 1959. Mrs. Hutcheson was one of the first women to be trained as a landscape architect in the United States. After studying at Massachusetts Institute of Technology, Martha Brookes Hutcheson opened her offices in 1901 and designed gardens for estates in Massachusetts, Long Island, and New Jersey. She became a member of the Society of Landscape Architects in 1935. Her design of this garden was completed in the late 1920s, shortly after the publication of her book, The Spirit of the Garden, in 1923. A significant portion of the gardens have been restored to their c. 1945 appearance with the assistance of funding made possible in part by the New Jersey Historic Trust/State of New Jersey and the Morris County Historic Preservation Trust Fund. The oldest section of the house dates from the 1720s. It was enlarged over the years. The music room, added in 1927, is now used as a meeting room and is available for private rental. In 1972, Martha Hutcheson Norton and her husband, Charles McKim Norton donated the property to the Morris County Park Commission in memory of the Hutchesons. Bamboo Brook Outdoor Education Center is open daily 8 a.m. to Sunset throughout the year. Originally, this was a farm pond which provided water for livestock. Its topography made it a good location to catch and collect rainwater. The Hutcheson’s eventually converted it into a swimming pool. The Circular Pool was a central water feature in the landscape and functioned as an anchor in the axial system of paths. Hutcheson designed a total of six axes that radiated from the Pool and connected to the adjacent units of the core landscape. The water was a reflective element that echoed the pools of the many Italian landscapes which Hutcheson studied. The Pool is sunken into the landscape with the adjacent slopes being most steep at the northeast and southwest sides. Steps are used to move up/down the slopes at six points around this water feature, while the topography directly adjacent to the pool is relatively flat. The vegetation in this area is also an important design element. A combination of evergreen and deciduous trees and flowering shrubs was used by Hutcheson to enclose this space while creating vistas that revealed glimpses of the enticing water within, as well as the open landscape beyond. Plant material in this area includes Scholar Tree/Styphnolobium japonicum, Flowering Dogwood/Cornus florida, Common Boxwood/Buxus sempervirens, and Serviceberry/Amelanchier canadensis. Eastern Redcedar/Juniperus virginiana, was used by Hutcheson on the southwest side of the pool to frame the vistas that extended to the fields beyond. The East Lawn and Coffee Terrace were organized by axial and cross-axial patterns. These axes were defined by both built elements and plant materials. The main axis, running northeast-southwest begins at the entry drive and is defined by a double row of Arborvitae/Thuja occidentalis. Opening up over the central part of the lawn, the axis is continued between a pair of pillars and a low stone wall that direct the view to the southwest. The axis became more focused over the Pool, with the use of vegetative ‘walls’ directing views further beyond to the open fields. It is clear from the study of historic images that Hutcheson uses existing vegetation on the property at the time of purchase as a basis for the location of some of these axes. Stone walls, steps, hedges and plant masses were used in the East Lawn to define axes and paths and to direct vistas to adjacent landscape units and wider views beyond the core. Today, the spatial organization of the East Lawn and Coffee Terrace remains as it was historically. Views along both series of axes are interrupted with mature vegetation today. The East lawn was designed as a flat, oval area of lawn with plantings placed in informal arrangements around it. Historic images also indicate that the path on axis with the Music Room door had a series of two to three steps leading down to the stone wall on the northwest side of the cold frames. The topography of this area has changed very little. Hutcheson used a variety of plant species and placed them in both formal and informal arrangements on the East Lawn. She used mainly green foliage plants and combined various textures to define or highlight spaces within the landscape. Influenced by the Italianate style, she also used vegetation to define movement through a space. For example, a double row of Arborvitae/Thuja occidentalis is formally placed at each end of the northwest-southeast axis across the East Lawn and Pool to define this axis and direct views beyond the core area. Hutcheson also used Common Boxwood/Buxus sempervirens at the southwest end of the lawn to define a smaller garden area within this unit and to accentuate the axial movement from the Coffee Terrace to the Orchard. Boxwood also lined the path at the southwest end of the Music Room leading to the Upper Water. A profusion of other plant materials were used within the planting beds in the East Lawn including shrubs such as Lilac/Syringa vulgaris, Amur Honeysuckle/Lonicera maackii, and Bottlebrush Buckeye/Aesculus parviflora. Vegetation around the East Lawn has changed extensively since the period of significance. While few species are still extant from the period of significance, most vegetation is missing or has changed in character due to its maturity. Views across the lawn to the Pool and beyond to the fields have been blocked due the maturation of the evergreens that originally defined this axis and defined these views. The Little House was designed as a getaway. The area around the Little House and Lower Pools was a wetland environment and provided a place for Ms. Hutcheson to plant different plant material than was used around the Upper Pools. Hutcheson laid out a “Long Path to Woods and Brook”, as it is called in her 1927 plan. Along this path Hutcheson placed the Little House over the small stream, in which a series of spills and small pools were created on both sides of the structure. An arbor was attached to the back of the house under which an informal path passes as it continues onto the southeast side of the structure. Hutcheson embellished the stream, creating spillways and a lily pool on the southeast side of the little house. The area around the Little House was planted with larger trees and shrubs such as Eastern Red Cedar/Juniperus virginiana, American Sweetgum/Liquidambar styraciflua, Elderberry/Sambucus canadensis, and Arrowood Viburnum/Viburnum dentatum. Herbaceous plantings were used along the stream banks included Sweetfern/Comptonia peregrine and various Iris species/Iris sp. Water was an important element in the garden and a distinctive feature of the picturesque style of design used by Hutcheson in the development of the garden. The upper pond was designed as a naturalized body of water with reflective qualities enhanced by the darkening of the bottom of the pond. This feature was placed to take advantage of both topography, reflection of plant materials and the architecture of the main house. Today, the Upper Water remains in its historic location and functions as an introduction to the system of water features in the core area. Plant materials used around this water feature were also naturalized, planted within the water and very close to the edge, overhanging the water in order to gain the most effect from the reflective quality of the pond. Hutcheson used a variety of materials in this unit that provide both interesting texture and color to enhance the reflection of the water. Weeping Forsythia/Forsythia suspense var. sieboldii , Amur Honeysuckle/Lonicera maackii, and Rhododendron/Rhododendron sp. are among the varieties of plants Hutcheson used to enhance the upper water unit. The vegetation at the Upper Water today includes many of the historic plantings. The circulation in this area consists of informal paths around the perimeter of the pond including access from the stone patio adjacent to the music room door and from the circular drive. The Pond was crossed with a slate bridge along this narrow path. These paths intersected on the southwest side of the pond with a wider path that moved along a northwest-southeast axis from the drive to the Circular Pool. The upper water itself is a concrete lined pool with stone edge. This feature was fed by springs and stormwater runoff in an elaborate system designed by Hutcheson and still functions today. The Upper Pond also includes the semi-circular patio adjacent to the Music Room entrance. The upper and lower bridges have been rebuilt using the materials are seen in historic photographs.